How much does it cost to travel to Chengdu? How much money will you need in Chengdu? ¥292 ($44) is the average daily price for traveling in Chengdu. The average price of food for one day is ¥126 ($19). The average price of a hotel for a couple is ¥242 ($36). Additional pricing is in the table below. These average travel prices have been collected from other travelers to help you plan your own travel budget. Chengdu is in China's Sichuan Provence and is in what is known as the Red Basin. It is a particularly fertile region in China that is known for its agriculture. For this reason it is sometimes referred to as the "Land of Milk and Honey". The Funan River cuts through the city but has almost no boat traffic anymore. The city itself has a wonderful relaxed vibe compared to the rest of China and is filled with green parks and places to relax. It is considered one of the most livable cities in China. Chengdu is the fifth largest city in China with a population of almost 15 million in the metropolitan area. It's also an important economic, financial, commerical, and cultural center for China. Chengdu has a monsoon-influenced humid subtropical climate. There are four seasons with most of the rain falling during the warmer months. Snow is rare during the winter months but frost may occur. 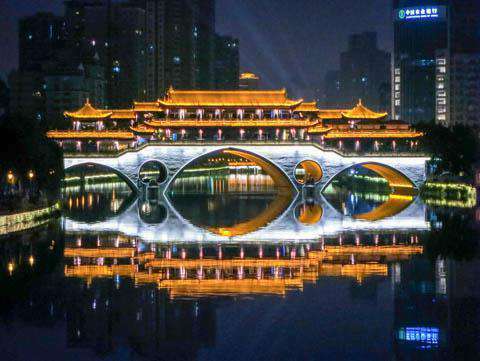 There are a good number of sights in Chengdu, including People's Park, Tianfu Square, Wuhouci Temple, Kuanzhaixiangzi, and Jinsha Archaeological Site, among others. Museums in the city include the Sichuan University Museum and the Sichuan Science and Technology Museum. Many people come to Chengdu specifically for the Chengdu Panda Research Base of Giant Panda Breeding. It is located in the outskirts of town and you can reach it by catching bus 902 at the Xinnanmen Bus Station. You can also pick up a taxi, which will cost you about 30 yuan from downtown assuming minimal traffic. The park has about 60 giant pandas, which are considered an endangered species in large part because of habitat destruction. They also have some red pandas and black-necked cranes. There is a viewing area where you can visit the giant pandas and the best time to visit is the morning when the pandas are moving around and more active. They usually feed the pandas sometime between 9:30 and 10:00. One of the main activities is to have your photo taking while holding a baby panda. This will set you back 1000 yuan and the entry cost of the facility is roughly 60 yuan. While it is a unique opportunity that you can't have anywhere else in the world, the whole experience feels very forced and awkward. You can expect little more than a moment to hold the animal while they quickly snap your photo. If you want a little more out of the experience you can hire an English speaking guide for the cost of 100 yuan. Chengdu's metropolitan area can be divided into five urban districts, four suburban districts, and nine counties. The city core is where you will find the Qingyang District, Jinjiang District, Jinniu District, Wuhou District, and Chenghua District. There are a variety of activities that you can enjoy while you're in Chengdu. There are many places where you can relax, sip tea, read books, play Weiqi, or have a massage. Chunxi is a shopping street that is pleasant to walk along during the afternoon. It's lined with clothing shops, book stores, restaurants, movie theaters, and arcades. Other activities include visiting the Happy Valley amusement park or going to the Sichuan Opera or a traditional show. Sichuan food is everywhere in Chengdu. The dishes are quite spicy but it is possible to order it without spice or a little spicy at most restaurants. It's also possible to break through the spice with sweetened soy, almond, peanut, or milk. The spiciest food in Chengdu is the hotpot. Sichuan hot pots are large soups that cook in the middle of the table. You can select meat, vegetables, and other ingredients to flavor the soup. Unlike eastern hotpots, you do not drink the soup but instead fish out the ingredients and eat them with chopsticks. Chengdu Shuangliu International Airport is about 20 kilometers outside of the city center. It's a major transportation hub for the country and there are flights from all over China as well as many international destinations. You can take a bus from the airport to the city center and, of course, taxis are available. There are also train bus connections to many cities within China. Chengdu opened a metro service in 2010. The original line ran north and south between the North and South Railroad stations along Renmin Road. In 2014, Line 2 was opened between Xipu in the northwest and Longquanyi in the southeast. There is a very comprehensive bus system in Chengdu. The system can be confusing and crowded, but it is a good option if you can figure it out. In general, rush hour has horrible traffic in Chengdu and traveling during these hours is best avoided.